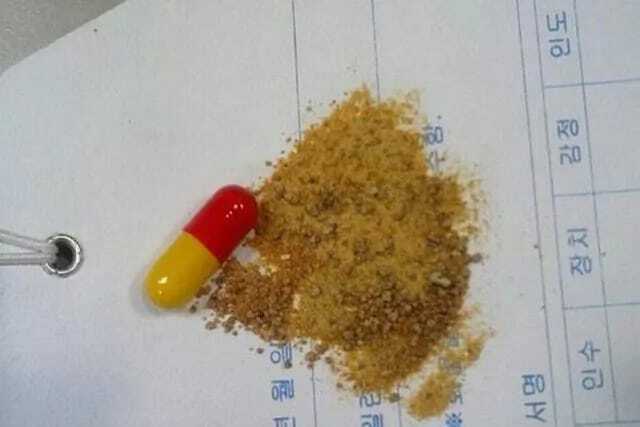 SPONSORED LINKS Swallowing or inserting illegal drugs, jewelry, money, or even animals in various body parts is a common practice among smugglers around the world. A woman in France tried to hide a child in her luggage. While a man in Cuba was suspected in the airport when curious bulges appeared on his pants – turns out he was trying to illegally transport tiny birds by sewing them in his trousers. Officers in Korea are under the same distress as they have seized 17,000 pills from China containing powered human baby flesh since August 2011.In a series of tests conducted by laboratories in South Korea, the contents tested 99.7- 99.9% human flesh. The capsules which are believed to be a ‘cure-all’ medicine and stamina booster actually contain harmful ingredients in addition to the human remains. The detained smugglers denied knowing the ingredients or the process behind in making them. These pills, believed to be manufactured in North Eastern China, are run by medical staff tipping off companies when there are aborted babies. The corpses will be brought to the homes of the traders where it will be refrigerated. The bodies will be dropped off in clinics and are placed in medical drying microwaves. Once the skin is tinder dry, it will be pounded into powder. In order to avoid thorough inspections, herbs will be mixed in the contents.